1. Soak Saltfish overnight then boil in fresh water until tender. 2. Drain fish, remove the bones and scales and flake. 3. Heat oil in a large heavy saucepan. Add pepper, scallions, onion and garlic. Cover and cook over low heat for 5 minutes, stirring occasionally. Add the tomatoes and simmer over moderate heat until heated through for about 2 to 3 minutes. Add flaked Saltfish along with margarine, salt and pepper. Cover the stew and simmer over low heat until heated through for about five minutes. 4. Arrange the Saltfish on a plate. Sprinkle with parsley and serve with dumplings, bread fruit and spicy plantains. Combine all the ingredients in a bowl. Toss until mixed. Fry in batches until golden brown and cooked. Remove and drain on paper towels. Serve along side Saltfish, dumplings and breadfruit. Melt butter or margarine in a heavy saucepan over medium heat then add oil. Add onions and cook until golden about 5 to 8 minutes, stirring often. Add garlic, thyme, red pepper and parsley and sauté for 30 seconds. Remove from heat and add breadfruit with chicken broth or other prepared liquid. Toss gently to blend and heat through. Season to taste with salt and pepper. Serve with dumpling, Saltfish and spicy plantain. Place flour, coconut, salt, margarine and oil in a bowl. Gradually stir in the water to make a stiff dough. Turn onto a lightly floured board and knead for about two minutes. Make dumplings in desired shape. Slide dumplings into boiling salted water. Cover and cook for about 10 to 15 minutes. 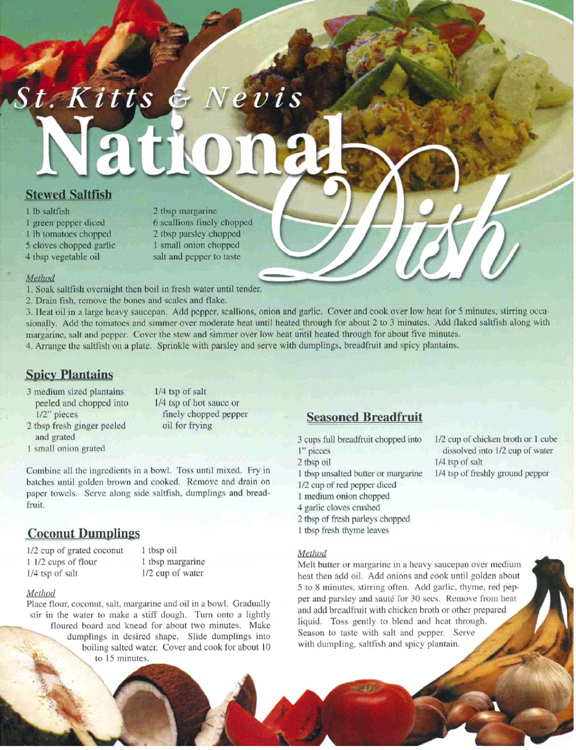 During the year 2003, as part of the activities slated to Celebrate 20 Years of Independence for the Federation of St. Christopher and Nevis, the Department of Culture, then under the Ministry of Information, Culture Youth and Sports (ICYS) lead by the Honorable Minister Jacinth Henry-Martin, organized two competitions. One was to identify a distinct male and female outfit and the other to create a culinary dish that would encapsulate the characteristics characteristics and spirit of Kittitian and Nevision people, while sharing their rich culture. The winning recipe was created by Jacqueline Ryan (869)465-1442 (“Jacqueline Salon de Beaute). Two of the judges were Lynn Williams owner of Island Spice Restaurant, Frigate Bay (869)465-0569 (Sugars Complex) and Telsa Johnston Chef at Marriott Hotel (Calypso Café). Today, there have been 26 visitors (67 hits) on this page!